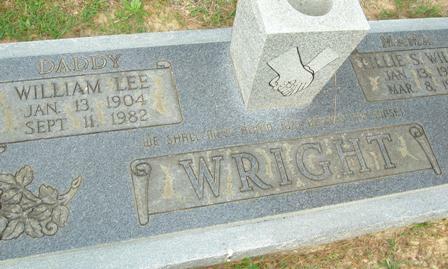 On this date, the 11th of September in 1982 our maternal great-Uncle William Lee Wright passed away. Lee was our Granny Dee’s oldest brother. 1- Milford Lee “Mutt” Wright*** – (November 18, 1930 – May 21, 2009) Buried in Mulhearn Memorial Park Cemetery, West Monroe, Louisiana. He married Lorene Wright. 2- MIldred “Mam” Wright Mayfield* – (May 12, 1928 – July 16, 2015) Buried in Hasley Cemetery, West Monroe, Louisiana. She married Sidney Mayfield. 3- Melba Wright Ramsey – (private) Married to Marvin Ramsey. 4- Marshal E. Wright* – (January 13, 1936 – October 13, 1976) Buried in Mulhearn Memorial Park Cemetery, West Monroe, Louisiana. 5- Malcolm Wright – (private) Married to Margaret Wright.